One petal at a time: The big gussy-up-the-floats week is here. We wouldn't call Southern California a place that regularly indulges doing the opposite of what is generally expected, though we do possess our charming quirks. Just when the country is donning tank tops, for example, in June, we're still in light sweaters, thanks to our famous gloom. We'll unfailingly add a "the" before a freeway number (because everyone should, really). And right when people elsewhere are packing up the Christmas decorations, we're getting down to the business of some serious decorating. It's the Rose Parade floats we speak of, those New Year's Day on-the-move marvels covered in millions of petals and pods and stems and buds of all sorts. This natural covering is dutifully, and even devoutly, applied by hand, thanks to the caboodle of volunteers who lend their petal-placing skills in the days following Christmas. There'll be five days of run-for-the-finish, push-into-the-evening 2016 float decorating, with several companies open to volunteer sign-ups. The Tournament of Roses has the full round-up of float-building outfits, both commercial and the self-builders, so eye the list and make contact if one tempts. The dates? Be ready to put petal to metal bars and structures from Tuesday, Dec. 27 through Saturday, Dec. 31. The 128th Rose Parade Presented by Honda rolls on Monday, Jan. 2. That's right: Monday. The floweriest procession on the planet never takes to the streets on a Sunday, and so it shall regally remain in 2017. 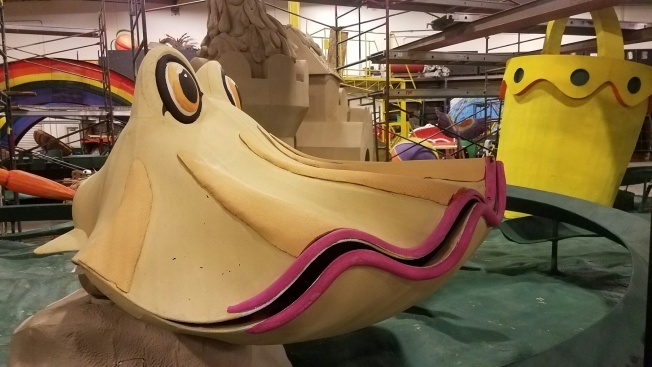 Is this the moment you finally cross this one, decorating a Rose Parade float, off the ol' bucket list? There's still some time left to go in 2016 if this commendable promise was one of the resolutions you made nearly a year ago. We know: You're just starting to undecorate your own home. But here in SoCal, we like to do things our own way, which means some mondo decorating kicks in while all the world is beginning to stow the wreaths and nutcrackers.